The folks at the Florida Museum of Natural History tell us that roughly fifty to seventy (50-70) shark attacks occur worldwide each year, a modest number considering the storied fear built around these jagged-toothed carnivores of the sea. Yet it's more than enough to keep the tension alive surrounding their shadowy circling and agile open-jawed lunges, and, along with a chilling description popping up on the news here and there, also enough to feed inspiration into the steady output of lifelike horror-thrillers that mimic their attacks. Australia's The Reef, like others of its type, hypothetically becomes more exhilarating since it is "based on real events", only the realistic surroundings that usually enhance our anxiety over the watery unknown -- and some scattered, deliberate usage of gore -- get lost in tiresome victim buildup and a null current of suspense. How much development do we really need to get to the blood-tinged bubbles and boisterous music? 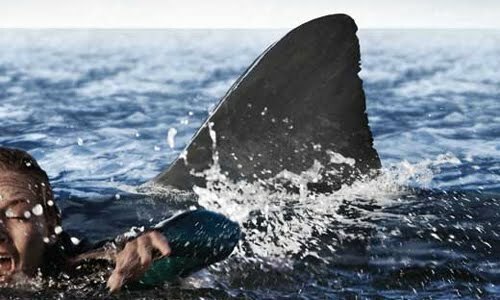 Campy outings like Deep Blue Sea might be able to rush exposition along to get to the carnage, but true-to-life jaunts like Open Water feed off relationship development before the "prey" bob and paddle through infested expanses of water. The Reef's aims face that same requirement; the story focuses on two couples -- one separated for some time -- that take a trip out to a spot neat a coral reef for a day, only to be confronted with tidal anomalies that leave their boat capsized, stranded, and temporarily floating. Left to decide between swimming through the crisp waters towards safety or stay atop the damaged vessel, some of them grab their wetsuits and get going, even with stern advisement against it due to the nasty things -- sharks! -- lurking in the water. The Reef's script wades through a lot of meandering relationship commotion and tedious situational bickering -- lots of pertinent yet dull yelling about the current, distance from land, and how unsafe the waters are -- before it gets near the danger-riddled tension it boasts, with emphasis blandly falling on the splintered couple, Luke (Damian Walshe-Howling) and Kate (Zoe Naylor). These stabs at generating empathy for the future victims frustrate more than anything, though, since their inert emotional capacity feel like filler to extend the idyllic footage of the crisply-photographed Queensland backdrops, with the stiff dialogue between the at-odds couple undermining the suspenseful circumstances that writer/director Andrew Traucki approaches. Instead of tapping into an emotional angle that might enhance the suspense, like the way the marital conflict in Open Water strengthens (and distances) the bond between the two drifters, it generates barely any attachment by way of inauthentic dialogue. Flimsy interactions with the victims could be shrugged off, if The Reef's flow would just pick up and drift them through waves of suspense; yet it never really finds its pace, leaving those trying to get wrapped up in their story checking their watches and waiting for any sort of projected bloodshed to commence. A few flickers of meager tension flare up -- a scene where one swimmer dips underneath and "into" the capsized boat for a supply does a fine job of creating edgy anticipation -- yet the whole atmosphere behind the focus on survival within the terrifying situation never catches on. To stir things up, Andrew Traucki drops in a few blunt jump scares and loud-mouthed reminders of the dangers within the ocean ("There's something following us! "), clumsily building towards what the giant dorsal-finned poster and continual yelling suggest. You really don't want to be in the situation where you're clamoring for The Reef to just get on with the ferocity suggested from the start, but it happens. Fortunately, the handful of shark attack scenes almost excuses the other blasé shortcomings, though it's not because of grueling gore (little more than crimson blood or a quick yank underwater) or startling anxiety. Andrew Traucki and his crew size up the massive, lurking great white -- gorgeously captured on camera for an impressively seamless effect -- with awareness of the depth and distance between the wading victims, dropping the line of sight to a petrifying viewpoint as the shimmering scales and graceful movement against the beast invoke primal electricity. These moments breathe life into The Reef, briefly ensnaring a rush of adrenaline as the hapless floaters ... well, they make questionable decisions, but at least their body language and shrill cries show some life. It's a shame that the rest of The Reef couldn't sink its teeth into the same intensity as its scarce moments with the great white, doling out only brief surface-level satisfactions within an Open Water replica that'll ultimately discourage shark fiends.